One of the quilts on the goal list for this year! Cheri Payne had a basket quilt along last year, and I kind of went my own way and made this four basket quilt. All the applique is done for the blocks, and most of it for the vines and cornerstones. Just a few pieces left to still applique down! The setting is my invention, or rather, the quilt came up with it and I just followed suit. I love it when the quilt decides what it wants to be!! Have a super day, each of you!! Here is where I am on my rainbow blocks...just a few colors into it. I think it will be very pretty when it is filled out with a rainbow of colors! Rosie the poodle is tired, after a strenuous day of quilt supervision and inspection, so she is resting by the blocks. These are the blue one I made for the month of January. Hurrah! This is last Saturday for the color BLUE, so I am linking up to Angela, at So Scrappy. If you would like to be in a drawing for this book, please just leave me a comment, and there will be a random drawing this coming week for the book. It is a good one!! Please see Angela's blog below to see all the rainbow scrappy goodness going on. So many lovely ideas!! I am still working on blue scrappy blocks, so stay tuned! So? Turns out I had a $75.00 credit at Amazon, for a reward program at work. I had the most fun ever browsing all the quilting goodies! I ended up choosing these bobbins above, because now I have a little bit of a lot of colors, for applique. I really don't have much thread, so this really expands my variety. Super fun! Some pretty fat quarters!! from the quilt shop...I am in love! A few backgrounds...and these are Cherrywood fabrics that I received for Christmas. And a few little packages of precut fabrics and a jelly roll. My quilt buddies had these t-shirts made, so I got one of those too. Hey, I made this quilt top some time ago...years. I think now, that it is about 1/2 the size it should be...these are six inch squares. I think I just made this UFO...U F Older! Because I really need to make it bigger!!! So I rarely shop...and this was a rare treat. I can't bring myself to actually unfold the fabrics and play yet...still admiring them. Do you do this too? Hee! Yahoo! For some silly reason, I was scheduled for five twelve hour days in a row...wheew! It is over! I was just messing around with some little pinwheel blocks, and made this candle mat. I have also been busy sewing and cutting Churn dash blocks for Barb's swap! I noticed that many of the swappers are sewing with cool fabrics, so I choose a warmer color for this bunch. At last! This one is all sewn together. I took a picture on the back patio...and I am so glad all the blocks are sewn together. This is a patient quilt. Many sewing and quilting peeps save all their little pieces and tiny unusable stuff to make dog beds. I thought I would never have enough to save so I tossed those little pieces away, until now. The last year, I have been putting everything into here that I absolutely could not use...and lookee! I have almost a pillowcase full, and that will be sewn shut and donated for a dog bed. I guess you never know until you try something! Have a great day, all of you!! So....are we running down the stairs??? Or, are we walking up the stairs? This one is on the list to finish this year, by golly!! Yahoo! All the blocks are done. Will this be OK for a patient quilt? The blocks are 7.5 inch finished...eight inch strips, 2 x 8 and 1 x 8 inch strips. I have been sewing rainbow birds the last few months. This month is blue!! Some birdies have long legs...and some short legs...and some legs are straight and some all which-a-way! I am in love with them!! Here are the blue birdies for this month. I confess, I have to do the math again every month to make them, and that makes me hesitate...but this month! I wrote all the pieces and parts sizes down! SNORT!! Yahoo! Incidentally, I love math, and took every math class my high school and college offered, up to Calculus and mathematical analysis. 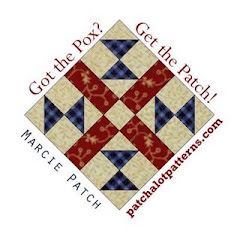 I find it amusing that the math of quilt making makes me a bit hesitant at times, LOL!!! I just love this grungy black plaid and green birdie...he might be my favorite!! And this is another favorite...this little baby dog guards the door each time I shower or bath...right there is where she stays, and she woofs at me if anyone comes near. I love her so dearly...precious little stray angel, with a forever home so I can spoil her rotten!!! Have a super day!! Have to go into work later for a mandatory class...new ventilators are coming. Part of a day at work. Slow stitching. Is there anything better? I love it! I usually do not have any time on Sundays for this, because I usually work the weekends at the hospital...but! I was called off today...then I was called in 3 hours later. BUT! there were those three hours...wheeeeeeee! I had coffee and worked on these blocks. I now have four blue blocks. The slow stitching part is the applique in the center of each block. These blocks are ten inches, finished, so will make a pretty large quilt with 48 blocks planned. Please see Kathy's blog here...I am linking to her, in celebration of slow stitching! Now a question for you! What color binding do I use for the above quilt?! Majority wins! A whole lot of cutting and a whole lot of thinking! I have so many plans and ideas that it is stifling me a little bit...even with lists and times slots and planning...it is just crazy making!! But in the midst of all the thinking...there is the actual sewing, which is the redeeming part of it all, LOL! Above it my blue block, for So Scrappy...please see below to see everyone's blue scrap projects for this week. 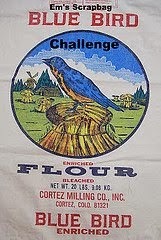 I embroidered this saying on my folk art basket block...and I must say, that was great fun! Relaxing and I just remember stitching penny squares as a child; embroidery that my mom started me on. Lovely memories! Mom...now she was a REAL quilter and seamstress...made all our clothing and quilted up a storm! Since it is "Blue" month at So Scrappy, I cut a ton of 2.5 inch strips for two quilts that I have in mind...neither one of which are on my list to make this year...but hey!! No rules here, right? I did make a mistake and stood barefoot for hours and cut strips, since the weather was so nice and sunshiny and warm...but my hips and knees and back really were aching last night. I guess I will remember to wear my tennis shoes with my supports in them next time I go on a cutting binge! With all the blue cutting, there were lots of tiny strings, too small to go in the string bin, so I made a couple coasters and put hearts on them too. That was fun!! Hope each of you is having a lovely day!! Whew! I worked a LOT of hours in the four days around the first of the year, so I am delighted to have a couple days off. GUESS WHAT??? Lori is having a quilt along!! It is a Cheri Payne inspired quilt...we are just all doing our own thing and making a quilt all our own, based on Cheri's quilt. I don't have the pattern, so I think it is great fun to design my own, pretty much based on her blocks. Lori blogs at Humble Quilts, below...this just started and so you can start and be all caught up right now!! Bonnie Hunter, as you probably know, has designed a fabulous mystery quilt each year around Christmas and the holiday time frame. I have not been QUITE (snort) keeping up with all the clues, but the big reveal has already been done! It is GORGEOUS!! However, I have been playing in the pieces and parts I have made...so I made this block. I love to play in the pieces!! Leftovers are lovely! I think that every New year I am going to toss the socks that I just CANNOT find matches for. Start the year fresh...or maybe I could just feed them to the dryer/washer system so the socks I have matches for will not be eaten, LOL! I always save mismatches, hoping the sock will show up...but it is time to start fresh. My goal was to walk 2017 miles in the year 2017, and I walked 2156, so I did it! Lots of those steps are taken at my work...but hey, they all count. Onward for 2018 miles in 2018! Just looking back, I started a whole bunch of quilts, and got quite a ways into making most of them. I won't bore you with all my starts, but on the list this year is to finish quite a few, but also to continue to start things. New ideas and fun quilt alongs make it just fresh and oh so fun for me. So onward! !